I often lament the fact that I don't get very many chances to sit down with a good book. I've realized recently, though, that I do it's just not exactly as I had imagined. My kids all share a room and that room used to get pretty loud at bedtime. We would go through our night routine and I'd say goodnight, leave the room and then wait on the couch for the visits to start. It irritated me to no end, because one kid out of bed would inevitably lead to another and another until I felt like a Jack-in-the-Box. So I totally revamped our evening routine and it's worked much better since then. My favorite part has been tweaking the way I read to them. I used to let them pick out picture books and we'd fight over which bed to sit in and whose books to read first. And obviously someone would pick a book that someone else didn't want to hear. Now we do it differently. I realized that Frances and Henry were ready to listen to some really good chapter books. And while Benjamin may be a little young for them, he follows their example most nights and listens along (otherwise he falls asleep or leaves the room; either of which is fine with me). I've really enjoyed picking out some of my own favorites to read to them. Nothing beats watching your kids get really involved in a story that you remember being involved in at their age! So here's what we've been reading lately (I've included Amazon links. If you click through and make a purchase, I will receive a small commission, but your purchase price is not affected). 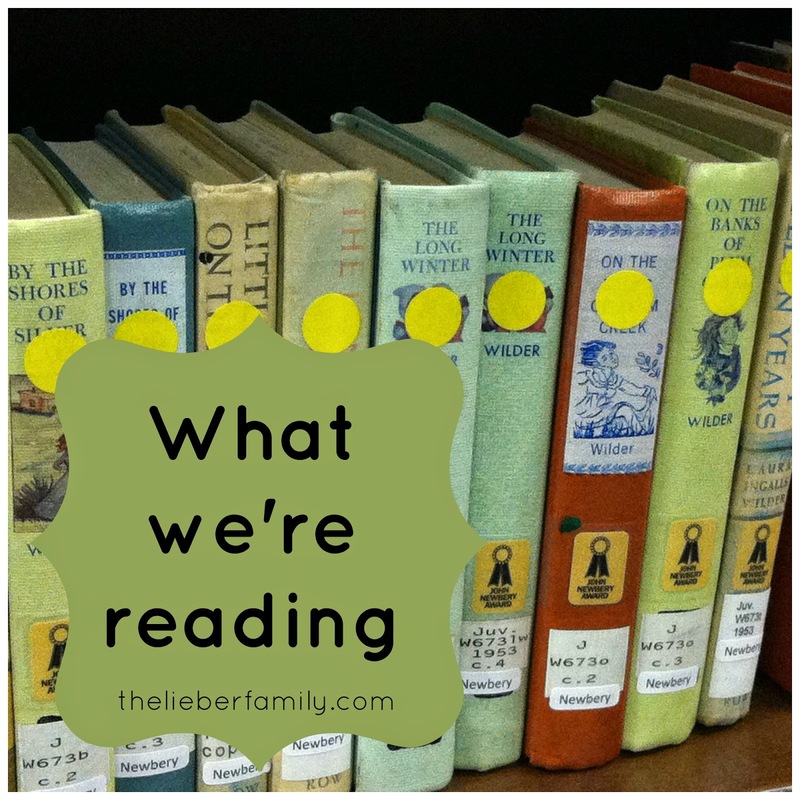 We started with The Chronicles of Narnia which the kids absolutely loved! It was so much fun to hear them making connections from one book to another. We then moved on to The Wonderful Wizard of Oz and The Marvelous Land of Oz . Since then we've read Peter Pan (which I had never read before), and then Little House on the Prairie and Little House in the Big Woods . Yes, we read them out of order. That was my fault! But I read the copies my grandmother gave me when I was a kid, so there's that! Now we've moved on to Mrs. Frisby and the Rats of NIMH . I loved this movie growing up, but I don't think I've ever read the book. I found the movie in a dollar bin at Big Lots last year, so they've seen the movie, but that just made them more excited for the book. We've just started, but I can tell they like it so far. I even find myself reading ahead after they go to sleep! Patience is not a virtue I've been endowed with! I've got a few more in mind, but I start to stress about it because there are so many books! I used to stress about all the good books I wanted to read, now I stress double because of all my favorites I'll have to re-read! All in all, it's not a bad problem to have. What are you reading with your kiddos? Such great choices! My kiddos are avid readers and we read all of the time. I have never read Peter Pan or Mrs Frisby and the Rats of NIMH. How do you like them? Most nights we only do one chapter, but there have been a few nights they couldn't even handle that! School is exhausting!! Peter Pan was very good. Disney stayed pretty true to the movie in that one. We've just started Mrs. Frisby and it's a long book. I can already tell they condensed it a lot to get to the movie, but that means the books has lots more backstory to it. I really like it so far. I was so excited when I found the movie for $1.50 at Big Lots! Then I was nervous to show it to my kids in case they didn't like it, but they did! They were really excited to see the book when I checked it out. I so love Little House on the Prairie! Ah, I love all of these! Although I never read about Mrs. Frisby and the rats of NIMH. I loved the movie, The Secret of Nimh, although it may have scared me too. Oh, those Little House on the Prairie books - some of my all-time favorites!!! The books, the shows, all of it! I can't wait until the new Laura Ingalls Wilder biography comes out! There are a few scary parts, but all in all I loved that movie. Now I'm excited to finish the book and watch it again! It's one series I could read over and over again! I'm also feeling like I just want to READ ALL THE BOOKS to the kids right now! I have to keep reminding myself that we have years and years of this ahead of us, and that eventually they can read the longer books to themselves too, so I won't be doing them a disservice if I don't revisit these with them again in a few years (although Narnia & Little House will probably get another read in a few years when the twins are old enough to appreciate them!). I'm really looking forward to introducing them to E. Nesbit and Edward Eager. And I remember loving the Moffatt books a lot when I was a kid. All the Noel Streatfield books are wonderful too, especially Ballet Shoes and Theatre Shoes (although Frances will probably like those more than the boys!). There are just so many good ones!!! I never heard of any of those you mentioned! Now there are EVEN MORE BOOKS!! My other problem is trying to balance books that will appeal to both Frances and the boys since they all go to bed together.